An Australian citizen convicted of drugs offenses was sentenced to four months in prison at Denpasar District Court on Tuesday, but he may be set free next week, once time already served is taken into account. Ricky Rawson, 49, was arrested on 21 May at Villa Tasaro on Jl Dyana Pura. Police found 0.06 grams of crystal-methamphetamine in his possession. During his trial, Rawson admitted to buying the crystal-meth, usually known in Indonesia as shabu-shabu, from a woman he knew as Mary at the Sky Garden nightclub in Kuta. He told the court that he used the drug to help cope with depression. Rawson was declared guilty under Article 127 of 2009’s anti-narcotics laws. 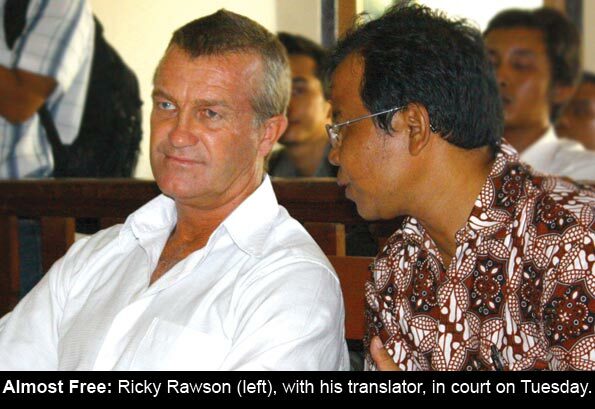 The public prosecutor Denny Iswanto had called for a six month sentence, saying that as well as knowingly breaking Indonesian law, Rawson had marred the image of Bali as a tourist destination. However, during sentencing on Tuesday presiding judge Dewa Made Wenten said Rawson would receive a lighter sentence due to his good conduct during the trial, and his history of depression. “The defendant suffers mental and behavioural problems that made him abuse narcotics. He needs mental rehabilitation,” he said, issuing a four month jail term. Since his arrest Rawson has been serving at Kerobokan Prison, where officials confirmed that time already served would be taken into account, and that he would be released as soon as the total four months had passed. “His detention started on May 24. We have to count first when he could be released,” prison administrator Made Suardana said.